In early August, eight teams of three riders each will tackle one of the most gruelling events in motorcycling – the Round the World Challenge. Meet ours. 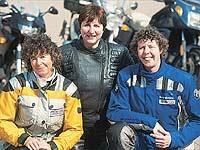 Jane Holmyard, Claire Janssenswillen and Nina Plumbe will aim to crack the18,000 mile journey through five continents, seven deserts, and 27 countries in three months. It’s an event that requires stamina, courage and a world-class sense of humour, qualities they have in spades. Together they have nearly 90 years of riding experience behind them owning everything from scooters to a Laverda Jota. The girls are already veterans of the tough Welsh Rally, where they were they only female team, finishing a very creditable eighth, ahead of most of their male rivals - in their first ever competition. Throughout the Challenge the girls will be sending regular updates to the site and you’ll be able to send your support and ask them questions through our message boards. While we all wish we could uproot and travel the world, very, very few of us choose to do it. In fact more women have been in space than circumnavigated the globe. So who are our team, and what pushed them to take up the Challenge? Nina " I am a divorced mother of three children currently running an arable farm in north Norfolk. I’m 51 with children now 24, 22 and 18.
" I was brought up in Norfolk then went to London as a student and stayed there for 22 years before the return to Norfolk so that husband could farm.
" Aged 16 I was given a Lambretta model F and that was the beginning of my two wheel life. Always a means of transport that was cheap and then absolutely essential in London where I would not live without a bike, I rode even when pregnant! Having begun on a scooter, I progressed to a motorbike a couple of years later and then owned a variety of mostly Suzuki bikes until two years ago when I bought a BMW F650. My previous bikes include several Suzukis a Honda 250 and a 500, a Kawasaki 600. My current bike is a BMW R850 R.
" Why do it? The timing was perfect – all the kids have grown up and when the chance came to ride around the world I jumped at it. " Claire: " I grew up in Surrey, and started motorcycling at 16 on a Honda SS50Z, then to a Suzuki Hustler 250. Passed my test. Next a Norton Commando 850 Interstate Mk3. I couriered on a BMW and got hooked on them.
" Later I moved to California, where I had a Suzuki Custom 450. Returning to the U.K. I bought an R100RT and a Laverda Jota (which I loathed with a vengeance!). Chopped in my R for a K100RT.
" I now ride a K100LT which I will be taking round the world. I live in Bristol with my partner Phil and two daughters, Gemma 15 and Pippa 11. I work for Bristol City council, managing a team of 21 staff providing care in the community. " " Why go round the world? Because it’s the ultimate challenge. " Jane: " I've been on bikes since I was a teenager, thanks to my best friend and his younger brother both being keen trials riders.
" I finally took my bike test 10 years ago, on a Gilera 50 (agh! ), and later bought my first V-Twin, a Motoguzzi 350.
" Circumstances sadly later forced the sale of that but it is still in the family with my brother-in-law! I bought my current bike 18 months ago, Honda Firestorm VTR 1000. Sadly due to the tea-cup sized tank it is not the bike for the challenge so I be swopping it shortly for a BMW R1100S. Having tried most of the rest of the BMW range I find it suits me best. Why do the challenge? Why not? I’m just a tomboy who is fulfilling a lifetime’s dream!